Hello, welcome! On March 22nd, 2018, the messenger angel of God brought on the following message of God to end-time Prophet of the last days, Benjamin Cousijnsen. Matthew 12, verse 40 Consider this: For as Jonah was three days and three nights in the belly of the whale, so will the Son of Man be three days and three nights in the heart of the earth. Amos 3, verses 6 and 7 Does the trumpet alarm sound in a city, without the people being afraid? Does evil happen to a city, and the LORD hasn’t done it? Surely the Lord GOD will do nothing, unless he reveals his secret to his servants the Prophets. Verily, one will be amazed at the Two Witnesses, whom one had rejected and has hated! 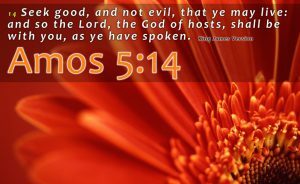 Amos 5, verse 14 Seek good, and not evil, that you may live; and so the LORD, the God of hosts, will be with you, as you say. Amos 5, verse 13 Therefore a prudent person keeps silent in such a time, for it is an evil time. Verily, evil speakers, and gossipers, and those who didn’t take God’s anointed ones seriously will begin to feel the sword of God in their soul, and perish. Amos 5, verses 18 and 19 Read this aloud; here it is written: Woe to you who desire the day of the LORD! Why do you long for the day of the LORD? It is darkness, and not light. As if a man fled from a lion, and a bear met him “or her“; or he “or she” went into the house and leaned his “or her” hand on the wall, and a snake bit him “or her“. Verily, even Jonah could not flee from God. Revelation 22, verses 6 and 7 Read this aloud: He said to me, “These words are faithful and true. The Lord God of the spirits of the Prophets sent his angel to show to his bondservants the things which must happen soon. Behold, I come quickly. Blessed is he, “but also she“, who keeps the words of the prophecy of this book”. ⟵Satan met zijn gevallen engelen werkt door mensen heen!